To do everything we can to help you reduce the stress of planning and arranging a funeral. To acknowledge that our first goal is to help you and your family deal with the loss of a loved one, and to use our Remembrance Process materials to give you all the information you need, and give you choices that help you and your family move from grieving to remembrance. To give you and your family a comprehensive resource tool our RemembranceProcess.com website where you and your family, even those members who don't live nearby, can obtain information, inspiration, and advice in the privacy of your home. To work sensitively with hospice and clergy professionals as true partners in helping you through the grieving process. To ensure you have exactly the same choices for family grieving and remembrance whether you choose burial or cremation. 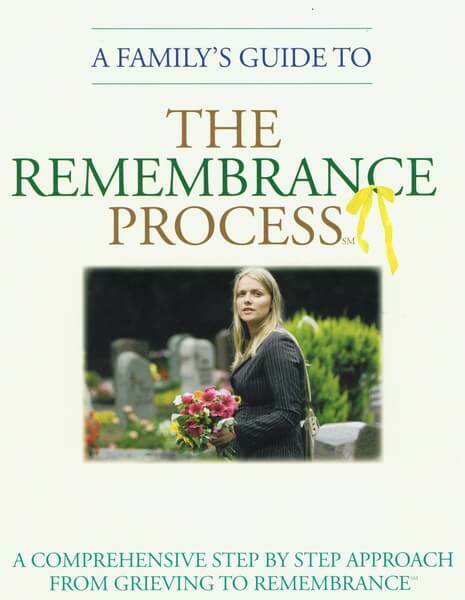 To provide information about cemetery, monument, cremation garden, and other "Remembrance" choices for remembering your loved ones, helping you move from confusion and grieving to on-going "Remembrance." To give you information, models and guidance for creating obituaries, eulogies, epitaphs, and other ways of "remembering" your loved one in words and images. To provide you with aftercare information about grief and grief-counseling programs that address the on-going needs of you and your family. To provide every family, in a straightforward and open way, the prices for all products and services we offer. To provide our services with integrity and the highest standards our profession as a family caregiver. To Always put your needs, desires and choices at the forefront of everything we do.